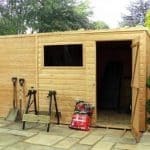 Standing at 12’ x 10’, the Shiplap Tongue and Groove Workshop Shed is a fantastic building for those with a large amount of outdoor and garden equipment to store. 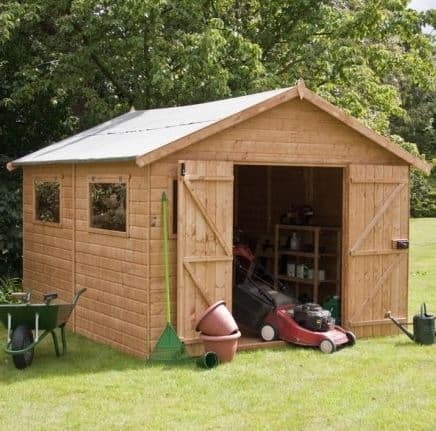 Alternatively, this shed could be used as a garden workshop for you to indulge in a range of gardening projects. 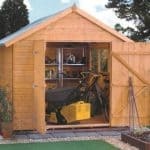 This is a tongue and groove shed that is perfect for workshop duties. It measures 12 x 10, and is therefore spacious enough for anyone who just wants to have a workshop and storage space for his or her tools and equipment. It is an apex workshop, so it’s also great looking in anyone’s garden. Plenty of floor space allows room for any equipment and tools you need to store, and the tongue and groove that runs throughout, including the floor, is sourced from Baltic pine. This wood is very strong and durable, and is much denser than conventional wood. With two hinged windows to one side, it allows the shed to be filled with light during daylight hours and for fresh air to be circulated throughout the interior when opened. Large double doors enable the shed to be fully open to the garden and allows for easy accessibility when storing or removing items. This shiplap tongue and groove shed has much to offer the larger garden or those with more items to store. 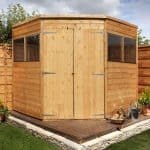 It’s 12′ x 10′ size means that it will very much be a feature within your garden and, given the higher price, you need to make sure that the shed your purchase meets all of your requirements. 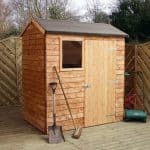 In this section we have a look in further detail at what features and uses this particular shed has to offer. Exterior: The shed exterior is constructed from 14mm shiplap tongue and groove cladding. 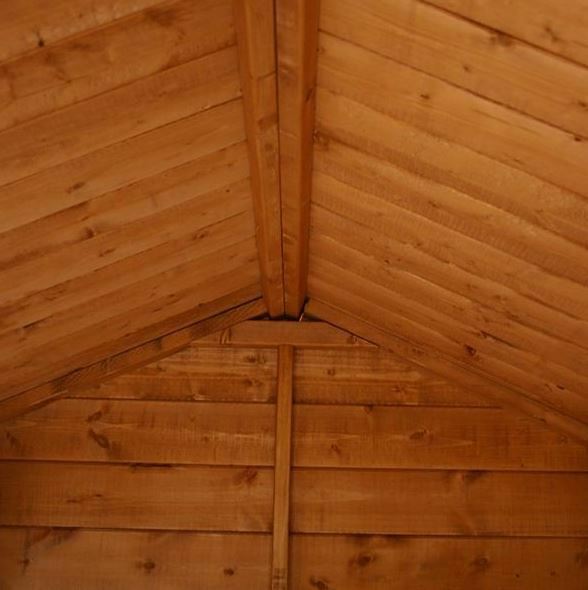 Baltic sourced pine is used, which is both denser and heavier than domestic timber, meaning that the materials are superior to similar sheds on the market today. Interior: The super spacious 12x10ft interior is accommodating for a large amount of outdoor or garden equipment; it would also be a fantastic workshop for that list of projects you have mounting up in your head. The interior is a blank canvas and could be arranged however you see fit. Further storage, shelving and hooks could be added to keep the space neat and organised. Windows & Doors: There are two large hinged windows to one shed of the shed that fully open, allowing fresh air to circulate throughout the interior. The advantage of two windows also means that the interior is filled with light, making it an ideal workspace. The double doors provide an extra-wide opening for accessibility of equipment large and small. 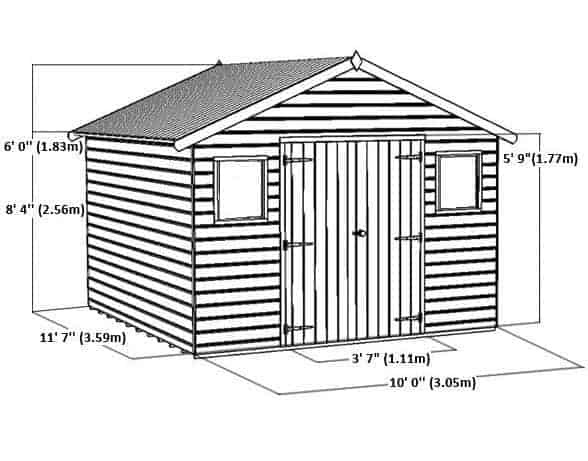 Security: With a shed this size, that will no doubt store a lot of equipment, we understand how important security is. 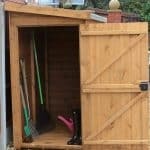 This shed comes complete with an integrated rim lock which will ensure that your items are kept secure whilst not in use. 12 x 10 Shiplap Tongue and Groove Workshop Shed: How easy to build? 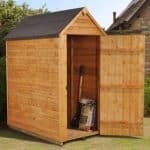 If you have limited DIY experience, don’t let the size of this shed put you off. It may be a large building but with no complicated features it is relatively straight-forward to assemble. It is recommended that two people assemble the shed together, for safety reasons and due to the size and weight of the parts. Step-by-step instructions will be included and all panels, parts, fixtures and fittings required will be provided in your package. Please note, a professional home installation service is available at an additional cost for those not wishing to assemble the shed themselves. 12 x 10 Shiplap Tongue and Groove Workshop Shed: What is the overall quality like? 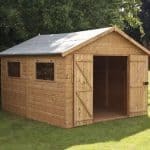 Given that this shed is at the higher end of the price range, you would expect that the construction and design be of premium quality; and on this point you would be correct. With 14mm tongue and groove cladding, the shed construction is both attractive yet practical. Built from Baltic sourced pine, which is denser and heavier than domestic timber, this is a shed that is fully protected from the elements and built to last. To provide a sturdy foundation for the shed it should be placed on a flat, level base. If there is nowhere suitable within your garden, a base is available to purchase separately. The shed floor is constructed from tongue and groove material, which is superior to the sheet board that most sheds use for flooring. The roof uses a heavy duty mineral felt to ensure durability, weatherproofing and longevity. 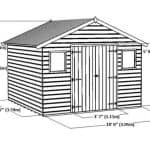 The 12’ x 10’ Shiplap Tongue and Groove Workshop Shed is a large garden building equipped to provide the ultimate storage solution or workshop space within your garden. With this deluxe shed, all of your needs will be met for many years to come. With large windows and doors, creating a light and airy environment, this is the ideal space for undertaking a range of gardening projects. 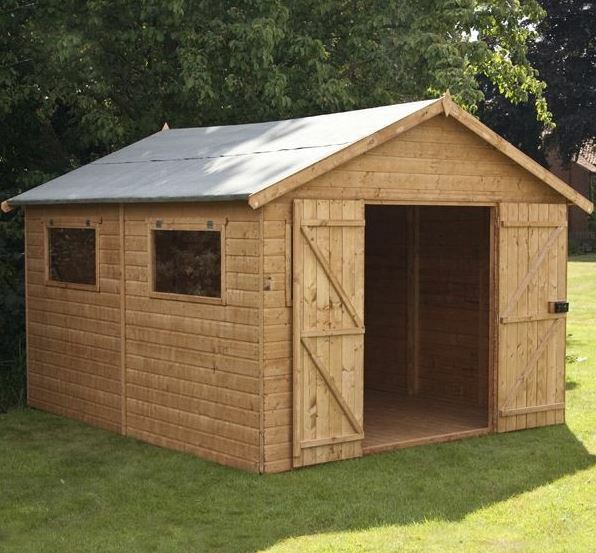 With an attractive exterior and high quality construction, even at this price you can’t go wrong with this super shed!